Prototype: 3 International Apfelpfeil Organization (IAO) hospitality. Former German Federal Railroad type UIC-x compartment cars for TEE service. Model: 2 of the cars are in the complete corporate color scheme. 1 car is in its original color scheme with corporate logo on the sides. The cars have different car numbers. Separately applied loudspeaker (non-working) on the roof. The car frames have a representation of the side skirting. Detailed trucks. The cars are ready for installation of 7319 current-conducting couplings or 72020 current-conducting couplers. The cars have adjustable buffers. Length over the buffers 81.2 cm / 31-15/16. DC wheel set 12 x 70 0580. In the 1970s, the International Apfelpfeil Organization (IAO) organized the so-called Apfelfahrten (Apple Trips), nostalgic trips throughout Europe with special trains. In 1976, the IAO took over the well-known Rheingold vista dome cars and other cars from the TEE car pool of the German Federal Railroad. 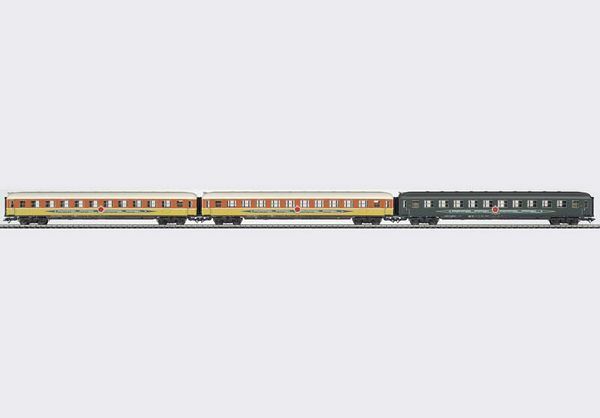 For several years the easily-identifiable trains were symbols of comfortable, exciting travel at reasonable prices. Later, faced with increasing competition from flat-rate travel with charter aircraft, this concept could no longer be sustained economically. In 1979 the IAO had to discontinue operations and declare bankruptcy. These special cars were sold to other tour operators and are still in use today. Some of them have been rebuilt. The 42995 and 42997 car sets go well with the model of the class 111 electric locomotive; item no. 37316.